Mathematical Creations at #TMC17 – Mister, is this right? Last week, I went to Atlanta for my first Twitter Math Camp (TMC). TMC is grassroots PD run by passionate teachers who talk about math ed via blogs and twitter. I expected TMC to be about pedagogy. I expected to hear about great lessons, great tasks, reusable structures, cultivating math mindsets, various manipulatives and representations, classroom organization, standards/alignment, assessments, collaboration, etc. In other words, I expected this conference to be about the same stuff that PD is usually about – I just expected this to be better. I was wrong … sort of. There was definitely some high quality PD, but my lasting memories are about making beautiful mathematical objects and wondering about their properties. For me, TMC was about doing unusual mathematics with other people and the playful curiosity that we experienced in the process. Below are some examples of our creations and the mathematics involved. I chose to attend the Math Yarns morning session because (1) I wanted to be guaranteed to learn something new, and I don’t know how to crochet nor do I know anything about hyperbolic geometry. (2) I wanted variety, and this session was bound to be much different than my afternoon sessions. (3) I like mathematical crafts, like modular origami, manifolds, straws thingy, and hexaflexagons. It took most of the first day to get the hang of the techniques, but by the end of the three days, I walked away with the object below. I created it by adding an extra stitch in every other loop as I went around the circle. Essentially, by adding extra stitches as I went around, the yarn bundles and curled, creating a curved surface. However, I still know very little about why this technique creates a “hyperbolic” surface, and I am curious about what is special about hyperbolic surfaces, and how hyperbolic surfaces vary. Because of David Butler’s generosity with his yarn and needles, I was able to keep working on the plane ride home, producing the object below by increasing every stitch. You can see more of what our group produced in the video below. Thanks to David and Megan for the great session. On Thursday night, I returned from dinner to people playing with curvahedra in the hotel lobby. I jumped in and made one, but that was the easy part. I saw Annie Perkins and Emma Veach (among others) making some big crazy thing. I asked about it, and they generously explained what they were doing: constructing a hyper-dodecahedron. I was familiar with a hypercube, but I had never given it much thought. In short, a hypercube is a four-dimensional object composed of eight cubes. When we try to squish a hypercube into three dimensions, the side lengths (which are all equal) get all distorted and it looks like a cube inside a cube. A hyper-dodecahedron is like that but with 120 dodecahedra. Why 120? I have no idea, and I hope I figure that out more about higher dimension polyhedra someday. We were able to make about a third of it before the shapes started warping too much, but it was beautiful. Somehow, I ended up with some curvahedra to take home, and they are awesome. I have only played with them for a bit, but I’ve already made a dodecahedron, icosahedron, tetrahedron, cube, triangular prism, and pentagonal prism. Should be some great new decoration for the classroom. Friday night was trivia night, but afterward, I walked into the hotel lobby to find people folding tetrahedrons out of circles. I jumped in and someone helped me figure out how to make some. Then we combined these tetrahedrons to make a level 3 Sierpinski Tetrahedron using 64 tetrahedrons. Sitting around afterward, someone asked about the missing space in the shape. 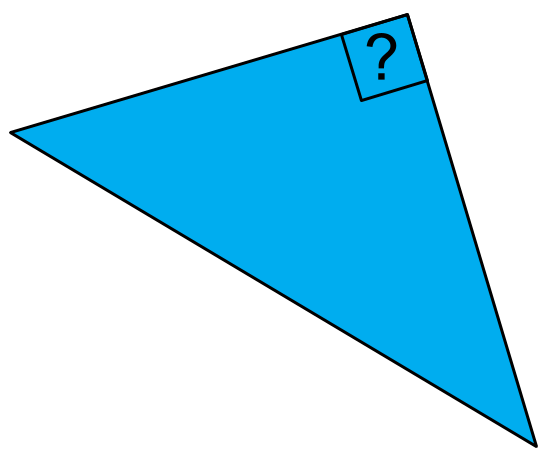 In the two dimensional version, the missing space is just upside down triangles of various sizes, but in the three dimensional version, we realized that the missing space was composed of octahedra! On Saturday night, we played board games. I played two rounds of David Butler’s wonderfully ridiculous play-doh game called “Home in One Piece.” While the experience was mostly silly, we also ended up talking about topology. Does it matter where your blobs are or what they look like? Not really, it just matters how many there are! I lost the first game because I couldn’t combine my blobs. But I won the second game! Two core components of my teaching philosophy are: (1) Math can and should be fun, and (2) Math teachers should do math. Play With Your Math embodies that philosophy, and I was honored to give a 5 minute talk to share that project with other teachers. Specifically, I challenged everyone to solve Eightfold. On Saturday night, many people gave it their best shot, and there were (at least) three Level 2 solutions. My first TMC was an amazing experience because I got to be around so many teachers who loved playing around with their math and who invited me to play and wonder along with them.